Designed to both inspire and instruct artists of all abilities, this book provides a wealth of practical guidance and projects on how to paint watercolour landscapes the easy way. In this comprehensive guide to painting watercolour landscapes, two of Terry Harrison's best-selling books, Painting Watercolour Landscapes The Easy Way and Brush With Watercolour, are seamlessly combined into a single volume. Drawing on his many years' experience as an artist, tutor and demonstrator, Terry shares his love of painting and shows the reader how to create beautiful, vibrant pictures filled with light and atmosphere using a range of simple brush techniques. 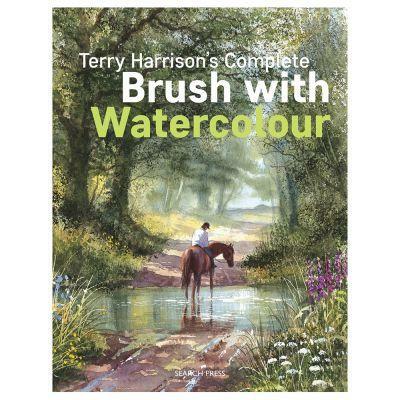 Designed to both inspire and instruct artists of all abilities, this book provides a wealth of practical guidance and projects on how to paint watercolour landscapes the easy way. The artist's two best-selling painting guides folded into a single edition this book offers a concise and practical guidance for painters of all levels working on watercolour landscapes. Forming a coherent course, it moves from simple technical explanations to demos covering every aspect of landscape painting with insightful instruction. Complete Brush with Watercolour makes a strong addition to the publisher's latest roster of exciting practical art and craft books. This is not a new book, except that it is, and it even feels like one. How so? Well, its another of those bind-ups that Search Press are becoming so adept at, comprising the original (and excellent) Brush With Watercolour and subsequent Watercolour Landscapes The Easy Way. As weve come to expect, you cant see the join and the new whole is, if not greater than the sum of its parts, then at least equal in terms of the usefulness of the book. The result, in fact, is one of the most coherent watercolour courses Ive seen in quite some time. Its slightly shorter than the combination of the originals, demonstrating that the preliminary material has been filleted for duplication. I also suspect that some running orders have been changed so that theres no jumping about. You cant, like Ernie Wises supposed wig, see the join. The best way to sum the book up, I think, is simply to list the main chapter headings: Choosing your equipment, Using the brushes, Techniques, Demonstrations. You see, perfectly logical. As to those brushes, yes they are all from the Terry Harrison range. Ive observed before that you may have suitable alternatives already, or you can get them one fan brush is, lets face it, pretty much like another. Except that it isnt. Terrys brushes have a very slightly ragged edge from new, so they dont produce a sharp line. Its a small detail, but worth pointing out as it shows the attention hes given them and that theyre designed to help you, rather than just make money for him. Quite a lot of artists have tried a brush range over the years, but Terrys has stood the test of time, which is an endorsement in itself. Sorry to bang on at length there, but I think its important to stress that Terry is assiduous in his efforts to help you paint, rather than simply to show you how clever he is. Its the main reason why, as well as the brushes, he himself is as popular as ever. Theres plenty here to like, from the simple technical explanations at the beginning, the exercises in skies, foliage, water, flowers and buildings as well as wet-in-wet, drybrush and the use of masking fluid. To conclude, the ten demonstrations cover just about every aspect of landscape painting across differing conditions and seasons. It really is that comprehensive.